TV My Wife Watches: I Got a Fish. His Name is Franck. And He Has a Twitter Account. I Got a Fish. His Name is Franck. And He Has a Twitter Account. INNNNNTRODUCINGGGGGGG, Franck Ribéry Jr, the newest member of the TVMWW family. My wife brought Franck home last week for my birthday. He's a betta fish. He currently lives in a bowl on our kitchen counter. Franck's hobbies include swimming. We've been talking about getting a pet for quite some time. A dog is probably too much work, and I'm allergic to cats, but Franck Ribéry Jr. seems just right. Last night he did like 400 laps. When we moved in together, my wife was forced to give up her two cats, Elliot and Jelly, which was sad. I liked Elliot and Jellz, even though they constantly made me sneeze. Elliot used to try to trip me when I walked by, but I knew it was out of love. Jelly would step on my face when I slept over. I didn't like that, but I understood. I have one of those faces that you just always want to step on. I've always felt baaaad that my wife had to give them up. Franck is named after Franck Ribéry, the French international football star, who currently plays for Bayern Munich in the Bundesliga. Franck Sr. has an unbelievable haircut and two massive scars on his face, products of a car accident that he was in when he was two years old. Last week, during an argument at halftime, Franck Sr. punched a teammate right in his face. In Ribéry's defense, the guy that he slugged is a major dickwad. 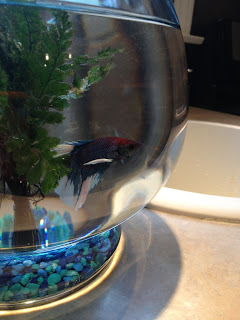 Franck Jr. is doing very well in his new home, thanks for asking. Tonight he is planning on going for a swim, and then going for another swim. Follow Franck on Twitter @FRibsJr. I pronounce the "C" with an "S" sound. Also, don't beta fish live for like a week or something? I'll tell ya in a week!